Steve Jobs announced the first iPhone on January 9th 2007 during Apple’s annual MacWorld conference. Almost nine years before a company called InfoGear released a product called the iPhone. InfoGear was later acquired by Cisco. The unit was run by a 16-bit processor and carried 1mb of memory. It needed to be connected to a wired infrastructure. The Infogear iPhone shared many similarities in concept as the Apple’s iPhone. The goal was to have a user friendly that can do many things. Ability to make phone calls, tap icons on a touch screen and being able to access web related content. 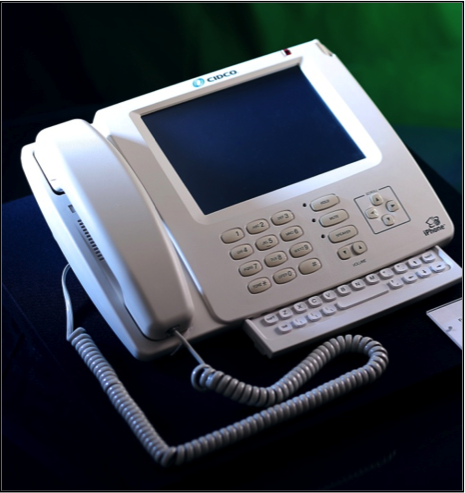 The iPhone brand was used in traditional Cisco landline phones and VOIP phones up until 2007. Apple and Cisco came to terms of the trademark in February 2007. This entry was posted in Blog and tagged cisco, iphone. Bookmark the permalink.